Cheers! 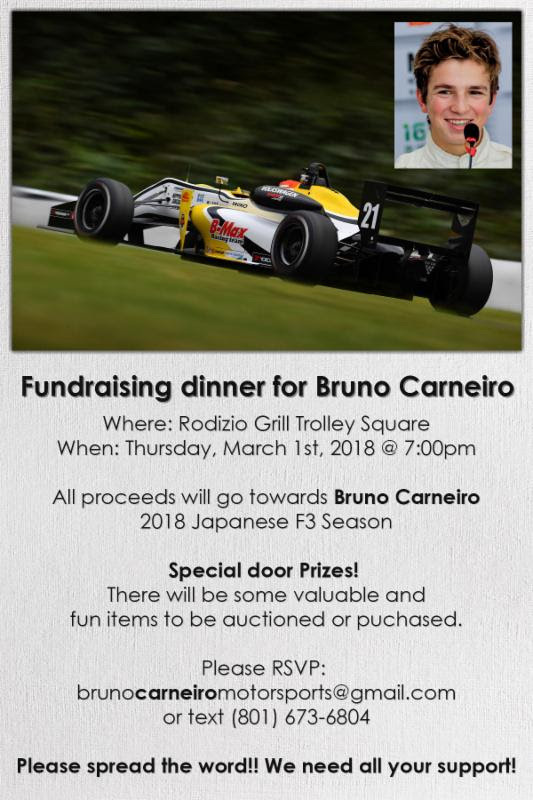 If you live in Utah and is wondering what to do tomorrow night (Thursday, March 1st at 7:00pm), we would love to invite you to enjoy a fantastic Fundraising Dinner for Bruno Carneiro’s 2018 F3 Season in Japan at Rodizio Grill Trolley Square! Impressive and valuable Door Prizes, incredible items to be auctioned like a Spa Victoria gift certificate for a Hydrafacial which is valued at $239.00, a brand new Arai GP6 PED helmet valued at $1,690 just name name a few! Come and meet with Bruno, friends and sponsors. A very cool display of helmets, trophies, videos and so much more! Previous post Bruno Carneiro 2018 from head to toe! Next post Bruno Carneiro has his hands full!